Abdominal cancer is a broad term for any cancer where there is an uncontrolled growth of abnormal cells anywhere in the abdomen: the area between the chest and the groin. Abdominal cancers can happen in and around any of the organs encompassed by the abdomen including the stomach, intestines, liver, gallbladder, pancreas, esophagus and many blood vessels. The medical oncology experts at Orange County CyberKnife and Radiation Oncology Center are internationally renowned for treating all types of cancer, including abdominal or stomach cancer. When old or damaged cells in the abdomen divide and multiply uncontrollably, a malignant mass or tumor is formed inside an organ in the abdomen. If not treated, this cancer can interfere with vital process of these organs as well as spread to other parts of the body such as the lymphatic system and lungs. Abdominal cancer can be fatal, especially if undetected and untreated. Survival rates for abdominal cancer vary based on the type of cancer and stage of advancement along with your age, medical history and other factors. For example, colorectal cancer can progress from noncancerous polyps to a malignant tumor over time if not detected and treated. Other types of abdominal cancer, especially pancreatic cancer, stomach cancer, and liver cancer, can be more difficult to detect and treat and have a bleaker prognosis, especially if diagnosed in later stages of the disease. Orange County has the most comprehensive cancer treatment facility in Southern California with the technologies and expertise to treat a variety of abdominal cancers alone or in conjunction with other treatment methods. Contact our cancer specialists today at (714) 962-7100 to find out more about how our CyberKnife and Radiation Oncology Center can best meet your individual treatment needs. Stomach cancers are usually found when a person goes to the doctor because of signs or symptoms they are having. The doctor will take a history and examine the patient. If stomach cancer is suspected, tests will be needed to confirm the diagnosis. When taking your medical history, the doctor will ask you questions about your symptoms (eating problems, pain, bloating, etc.) and possible risk factors to see if they might suggest stomach cancer or another cause. The physical exam gives your doctor information about your general health, possible signs of stomach cancer, and other health problems. In particular, the doctor will feel your abdomen for any abnormal changes. If your doctor thinks you might have stomach cancer or another type of stomach problem, he or she will refer you to a gastroenterologist, a doctor who specializes in diseases of the digestive tract, who will examine you and do further testing. Often the best approach uses 2 or more of these treatment methods. The stage of a cancer is a description of how far the cancer has spread. The stomach cancer’s stage is an important factor in choosing treatment options and predicting a patient’s outlook (prognosis). There are actually 2 types of stages for stomach cancer. If surgery is done, the pathologic stage can be determined using the same test results used for the clinical stage, plus what is found from tissues removed during surgery. Q. What is stomach cancer? Stomach cancer is when cancer cells begin growing in the stomach. Because stomach cancer is rare, doctors do not do routine screening in the United States. Stomach cancer is often diagnosed in its later stages because there are often no symptoms early in the disease. This makes it harder to cure. Stomach cancer is becoming rare as methods of preparing and preserving food continue to improve. 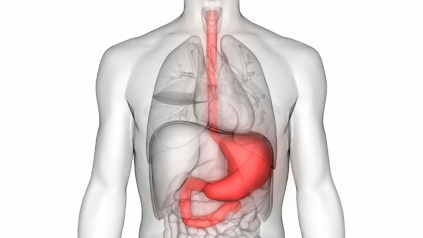 Stomach ulcers, which are very common, are not the same as stomach cancer. Q. Who develops stomach cancer? It is found mostly in people between their late 60s and 80s. Stomach cancer is more common in men than in women. The disease is more common in Hispanic Americans and African-Americans than in non-Hispanic whites. Stomach cancer is also more common in some parts of the world, such as Japan, China, parts of Southern and Eastern Europe, and South and Central America. Q. What are the risk factors? Diet. People who eat a lot of foods that are smoked or not properly refrigerated, fish and meats that are very salty, high-starch and low-fiber foods, and vegetables that are pickled are at increased risk of getting stomach cancer. Tobacco and alcohol use. People who use tobacco and alcohol heavily (a pack or more of cigarettes a day and two or more alcoholic drinks a day) are at a higher risk for getting stomach cancer. Weight. Obesity is linked to many cancers, including stomach cancer. Stomach polyps. The risk for stomach cancer is higher in a person who has had small growths called polyps in the stomach. Stomach surgery. Those who have already had surgery to remove part of their stomach for stomach ulcers or stomach cancer may be at greater risk for either a new or recurring stomach cancer in the remaining stomach. Helicobacter pylori infection. These bacteria often cause stomach ulcers, which can damage and shrink the stomach’s lining. This leads to a higher risk of stomach cancer. Pernicious anemia. This type of anemia is caused by the body’s inability to absorb vitamin B12. People with pernicious anemia have an increased risk of developing stomach cancer. Menetrier disease. This is a disease in which the stomach lining is overgrown and there is not enough stomach acid. For reasons not clear to doctors, people with Menetrier disease are at a slightly increased risk of developing stomach cancer. Gender. Stomach cancer is more common in men than in women. Age. After the age of 50, there is increased risk for stomach cancer. Family history. People who have first-degree relatives (mother, father, sister, brother) who have had stomach cancer are more likely to get it. Type A blood. People with type A blood are at a slightly higher risk of getting stomach cancer. Researchers do not yet know why this is true. Q. What are the symptoms of stomach cancer? A person should see the doctor if they are having any of these symptoms. The symptoms are most often a sign of something other than stomach cancer, but it is important to make sure. Q. How is stomach cancer diagnosed? Q. How is stomach cancer treated? Q. Should everyone get a second opinion for a diagnosis of stomach cancer? Q. How can someone get a second opinion? Ask a primary care doctor. Your doctor may be able to suggest a specialist. This may be a surgeon, medical oncologist, or radiation oncologist. Sometimes these doctors work together at cancer centers or hospitals. Never be afraid to ask for a second opinion. Call the National Cancer Institute’s Cancer Information Service. The number is 800-4-CANCER (800-422-6237). They have information about treatment facilities. These include cancer centers and other programs supported by the National Cancer Institute. Seek other options. Check with a local medical society, a nearby hospital or medical school, or support group to get names of doctors who can give you a second opinion. Or ask other people who’ve had cancer for their recommendations. Q. How much of the stomach is removed in people who have stomach cancer? There are two kinds of surgeries to remove stomach cancer. One kind removes only the portion of the stomach that contains cancer. This is called a partial gastrectomy. The other removes the whole stomach, and is called total gastrectomy. Which type a person gets, or if they get surgery at all, depends on the stage and type of stomach cancer they have. Q. How does a person eat after surgery for stomach cancer? A person who has surgery for stomach cancer will likely meet with a registered dietitian to discuss what they can and cannot eat during and after treatment. After a partial gastrectomy, where only part of the stomach is removed, most people will be able to eat much the same way they did before. Although they may have to make some changes to the way they eat. A person who has had a total gastrectomy has had their whole stomach removed. They still swallow and eat in the same way because their surgeon connects the esophagus to the small intestine. The surgeon may place a small feeding tube, called a jejunostomy (J-tube), into the small intestine at the time of surgery. Nutrition is given through this tube for a while after surgery during recovery. Diet changes are also needed after total gastrectomy. Most people who have their stomachs removed find that they prefer to eat small meals more often, rather than large meals three times a day. Q. What is new in stomach cancer research? Cancer research should give you hope. Doctors and researchers around the world are learning more about what causes stomach cancer, and are looking for ways to prevent it. They are also finding better ways to detect and treat this disease.